Here are a few of our favorite dive sites in the Charleston area. We are continuously updating this page! Keep checking back for more pics and dive site info! The cruising cutter Comanche, was the fifth of six "165 foot(A)-class" cutters that were constructed based ons light ice-breaking and the first class that utilized geared turbine engines. Comanche was capable of breaking up to 2 foot of ice because of a reinforced belt at the waterline. It was launched on September 16th 1934 and its service ended July 29th 1947. In 1984 the cutter was donated by the Virginia Pilot's Association to the the Patriot's Point museum. The ship was badly damaged in Hurricane Hugo in Sept 1989 by banging up against sister museum ship USS Yorktown. In 1989 the museum was discussing the disposal of the cutter, but in 1991, when Patriot's Point was taken over by the State of South Carolina, the ship was still listed among its assets. 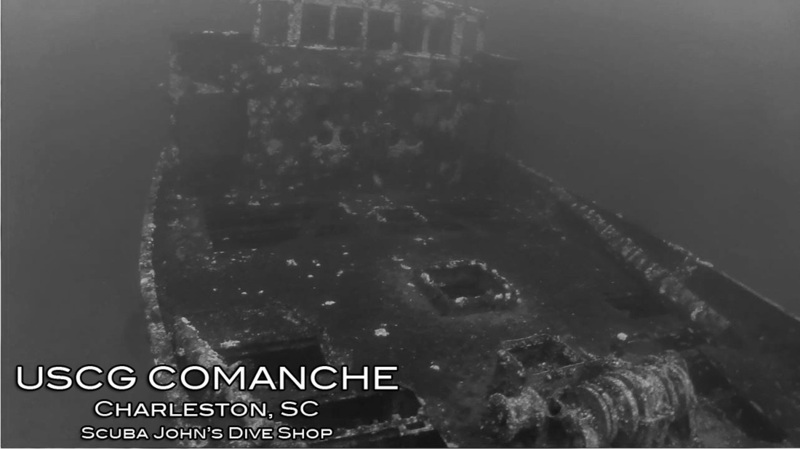 It was later sunk as an artificial reef off the coast of Charleston. The dive site is filled with marine life and is a great place to spearfish for grouper, sheepshead, flounder, cobia, black sea bass, and numerous other species. Normally, we see sharks, lobster, and many tropical fish. Max depth is around 120' on this dive. You need to be certified advanced open water and nitrox is strongly encouraged. The Y-73 is 180-foot tanker. In the same area are a few 90ft long tug boats. We will normally dive the y-73 and the tug boats the same day. There are usually sharks, giant southern sting rays, loggerhead turtles on the y-73. Lots of good grouper, red snapper, cobia, flounder, spadefish, sheepshead, and many tropical fish on these reefs. The max depth is around 110'. You need to be certified advanced open water and nitrox is strongly encouraged. **All of these pictures were taken at the y-73 dive site! This is Scuba John's favorite dive site. It has around a 90' max depth. With nitrox you can get some really nice bottom times! It is filled with grouper, snapper, cobia, lobster, sheepshead, triggerfish, black sea bass and many other game fish. Normally we see a lot of guitarfish, big rays, sharks, various species of eel and a whole bunch of tropicals! You will need to be advanced diver certified and have a surface marker buoy to dive this site. Check out our spearfishing video with footage of the garden ledges! This dive site sits in at a max depth of 60'. This dive site has many different spots to dive on. Barges, Bridge rubble, missel sleves, and army apc's. We use this site to train basic open water students. We have taken the occasional grouper from this site, but we love it for the sheepshead. **All the fish in these pictures was taken at the Charleston 60!